Last month a group of representative community members and economic experts organized by Alaska Common Ground met with an audience in Anchorage to discuss “The Costs of Alaska’s Economic Roller Coaster.” It was an enthusiastic and civil discussion, peppered with questions from an engaged audience and moderated by John Tracy. These people clearly loved Alaska and cared about its future prosperity. They all emphasized that we were at a turning point in the state’s history and should take a long-term view to achieve fiscal stability. New sources of state revenue were essential. Most reasonable cuts have already been taken. There was also consensus that moderate dividends should be continued. During the discussion Tracy asked the audience for their opinions by a show of hands. Most supported all points of consensus. Video of the discussion can be reviewed online. This month, Alaska’s new governor, Mike Dunleavy, also chose fiscal stability as the focus of his budget plan. But Dunleavy’s proposals are radically different from those of the Anchorage community leaders. He takes new revenue totally off the table. Faced with the looming fiscal shortfall, Dunleavy would cut $1.8 billion from the budget, eliminating state funds for programs that people rely on and have been developed with years of effort. On the other hand, he would spend about $1.8 billion for supersized dividends. Sen. Natasha von Imhof, chairwoman of the Senate Finance Committee, has aptly referred to Dunleavy’s supersized dividends as the “elephant in the room.” When questioned about this plan, Dunleavy’s spokespeople say he wants to let Alaskans decide how to spend the money, not government. Unfortunately, this answer ignores the fact that government – accomplishing together what we cannot do as individuals – is essential to life in a functioning community. Try driving across town when the streetlights aren’t working to clarify this concept. Dunleavy’s cuts are wide-ranging, but many reduce services to those who are poor or live in small communities and would be unlikely to speak up. When asked about the proposed cuts to maintenance of airstrips in small remote communities, the governor’s spokesperson replied, “We can’t be all things to all people.” Tell that to someone with appendicitis. Alaskans pay for governmental services at the municipal level, but only minimally at the state level. Across the U.S., per capita broad-based state tax revenues are about $2,600 for all the states. In Alaska, the figure is about $540. John Tracy asked the audience at Alaska Common Ground if they would be willing to pay $2,600 in state taxes. To his surprise, most raised their hands that they would. Taxes should and could be set to spare those with low to moderate incomes, and to tax people who earn in Alaska but reside Outside. The Legislature has been questioning Dunleavy’s spokespeople on many fronts. A recent exchange involved his move to switch from state-run to private prisons. Would a business whose profit depends on the length and amount of incarceration implement programs that cut the need for incarceration? It should be concerning that the governor chose Wildwood Correctional Center for initial cutting. Wildwood is the prison that had started to implement innovations in prison management from Norway and Ireland that reduced post-release crime by as much as 20 percent, as seen in the documentary “Breaking the Cycle” on Netflix. Alaska’s legislators are up against a challenge. The governor has veto power over all bills, and our Constitution (Article 2, Section 16) requires an affirmative vote of three-fourths of the Legislature to override a veto of a budget-related bill. 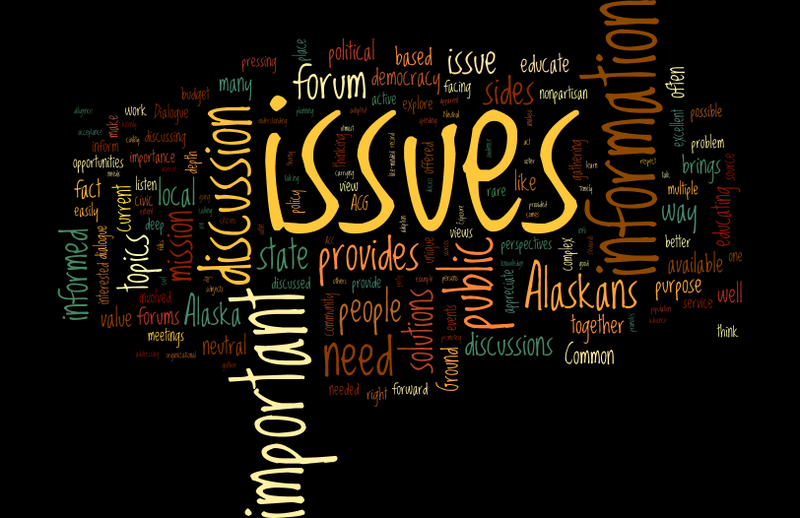 If the legislators want to counter the governor’s plans for Alaska, they will need to work together. But, it’s possible. Last year’s Legislature successfully worked across the aisle to adopt SB 26, establishing the percent-of-market-value (POMV) endowment system for sustainable annual draws from the Earnings Reserve Account, the spendable part of the Permanent Fund. This year, through a similarly united effort, the Legislature could pass a new bill establishing the annual apportionment of POMV funds between dividends and other governmental costs. If enacted early this session, there would be time for the governor’s expected veto, and for the Legislature to override his veto. The act should be effective immediately. It would convert Sen. von Imhof’s “elephant in the room” into a manageable reality, protecting the dividend for future generations and leaving part of the state’s current revenue available for state government. The Legislature could then proceed to pass a reasonable budget including needed programs and the new revenue measures necessary to fund them. The public would appreciate it! Read the full article at the Anchorage Daily News here. economy and the benefits of a stable source of state income. 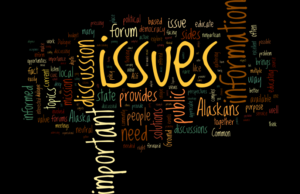 Ready to delve into Alaska’s fiscal issues? Here are the slides from House Speaker Bryce Edgmon’s presentation to AFN in October. We’re looking to host a discussion on the issues raised by this information. Click on this link to check out the slides. Wondering how to vote on ballot measure 1 in the general election this November? We held an event discussing the pros and cons of this ballot measure. You can find out more about this event and watch the video or listen to the audio here. Thanks, Anchorage Daily News, for asking the public to express opinions on the Permanent Fund, the Permanent Fund Dividend, and the plan for annual “Percent of Market Value” draws from the Permanent Fund that would provide for both government services and dividends (POMV). In answer to ADN’s request, here are some highlights from Alaska’s history as a state that may provide guidance for the future. After all, one definition of insanity is making the same mistakes repeatedly and expecting different results. Surprisingly, unexpected disasters have been instrumental in breaking the grip of major economic recessions in the past. Both the 1964 earthquake and the 1989 Exxon Valdez oil spill occurred during serious recessions. Expenditures to recover from both disasters injected enough money into the economy to overcome the economic doldrums. We never hope to be “lucky” again because of disaster, but the lesson is clear that recovery from a recession can be boosted by spending. Cuts in spending have an opposite effect. Uncertainty increases recession by slowing business investment. The Legislature could address uncertainty and help stabilize the economy by enacting legislation establishing a disciplined POMV process for spending. This system — the same system as that used by many major corporations to protect endowments — has been recommended by the Alaska Permanent Fund Corp. since 2003. Given the need to stabilize the economy, it is alarming to hear that some legislators are planning to bypass the discipline imposed by POMV, and simply adopt a budget that would spend directly from the Earnings Reserve Account of the Permanent Fund. Legislative spending needs the restraint of POMV to provide stability and protect the dividend. A look at Alaskan history gives a clear warning of what could happen without spending sidebars. In 1969 when Alaska received a fiscal windfall of $900 million from the oil field lease, legislators competed to fund new projects in their districts. If one district got approval for a library or a community hall, other districts needed similar things. Some economic development projects were clearly boondoggles. Public alarm at the rapid spending, together with leadership from Gov. Hammond and wise legislators like Hugh Malone, resulted in the constitutional amendment that created the Permanent Fund in 1976. Four years later Hammond urged legislators to adopt a bill creating Alaska’s Permanent Fund Dividend program. He wanted to the give the public a vested interest in protecting the Permanent Fund, and to assure that both rural and urban communities benefited from Alaska’s new oil wealth. Alaskans received their first dividend checks in 1982. This was fortunate timing, but it did not prevent the recession that occurred because of a fall in oil prices, and expiration of the $900 million construction boom. The state income tax had been repealed in 1980, and the shortage of funds for essential state services led to further cuts in employment which, in turn, added to the negative ripple effect. The recession was severe. Hammond ultimately realized that the only solid protection for Alaska’s dividend program was an ongoing source of state income. In 2004 at the Conference of Alaskans in Fairbanks he argued strongly for an income tax, saying his biggest mistake as governor was not to have vetoed the bill repealing the income tax in 1980. A year later, Gov. Jay Hammond died, having made an enormous contribution to Alaska by leading the establishment of the Permanent Fund and the Permanent Fund Dividend. He was a Republican who saw the big picture, perhaps Alaska’s greatest governor. • Wasteful overutilization of certain procedures and treatments that are particularly profitable for physicians on the Last Frontier given Alaska’s unusually high reimbursement rates. Alaska Common Ground will take a deep dive into the difference between the health care costs of Alaska and those of the rest of the country at an event Wednesday evening, Dec. 13. This event — the third of at least four events on our state’s high health care costs — is at the 49th State Brewing Company, 717 W. Third Ave., from 7 p.m. to 9 p.m. The Anchorage Public Library is cosponsoring this series, which is financially supported by the Alaska Humanities Forum. This event is open to the public and free, with a requested donation of $10. Important players in the health care field will hash out on Wednesday the relative importance of the factors set out above — and others — in the high costs of Alaska’s health care. Participating that evening will be physicians, a hospital CEO, a state of Alaska regulator and other knowledgeable observers. There will be an opportunity for the audience to ask questions.